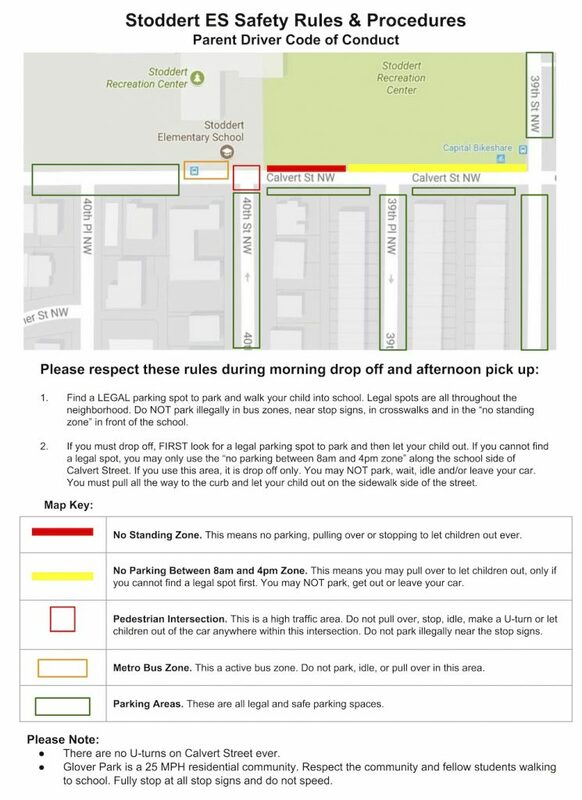 Find a LEGAL parking spot to park and walk your child into school. Legal spots are all throughout the neighborhood. Do NOT park illegally in bus zones, near stop signs, in crosswalks and in the “no standing zone” in front of the school. If you must drop off, FIRST look for a legal parking spot to park and then let your child out. If you cannot find a legal spot, you may pull over only at the “no parking between 8am and 4pm zone” along the school side of Calvert Street. If you use this area, it is drop off only. You may NOT park, wait, idle and/or leave your car. You must pull all the way to the curb and let your child out on the sidewalk side of the street. There are no U-turns on Calvert Street. Glover Park is a 25 MPH residential community. Respect the community and fellow students walking to school. Fully stop at all stop signs and do not speed.